The University of Glasgow has been awarded £10m towards the development of a new clinical research facility at the South Glasgow Hospitals Campus – more on the October news page. The site of the New South Glasgow Hospital has been transformed by the building of the Adult and Children’s Hospitals. Designed by IBI Nightingale (formerly Nightingale Associates, now part of the IBI Group, headquartered in Canada), the £842m publicly funded development, scheduled for completion in 2015, will give Glasgow one of the most advanced hospitals in the UK and will be the largest critical care complex in Scotland. 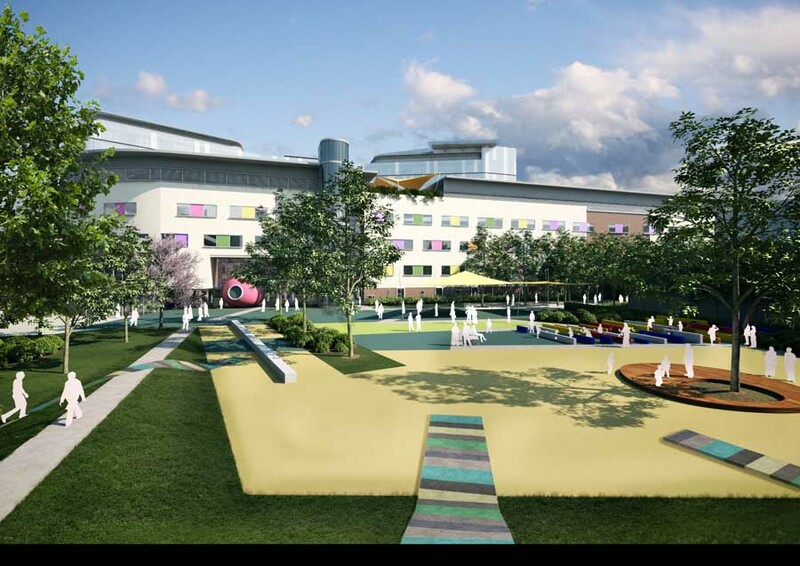 The site of the New South Glasgow Hospital has undergone extensive demolition and enabling works have now commenced to prepare for the build of the Adult and Children’s Hospitals. Designed by Nightingale Associates, the £842 million ‘super hospital’ is Scotland’s largest single investment in healthcare services ever. The new hospital, located on the Govan site, has the potential to become one of the most advanced medical campuses in Europe. It could also catalyse economic and social regeneration in Scotland. The local community will benefit from new infrastructure, particularly improvements to public transport and access to amenities and pedestrian routes. 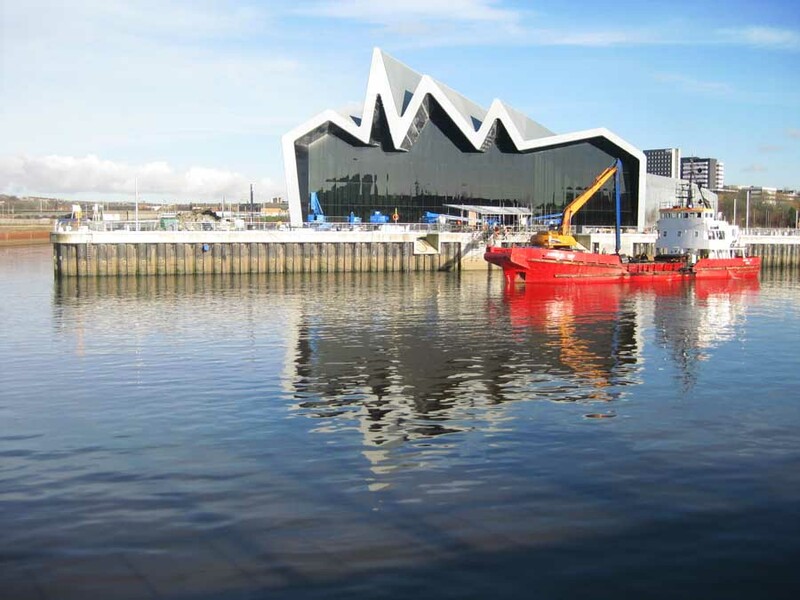 Nightingale Associates’ design has been inspired by Glasgow’s maritime heritage. The scheme has been fragmented into three sections. 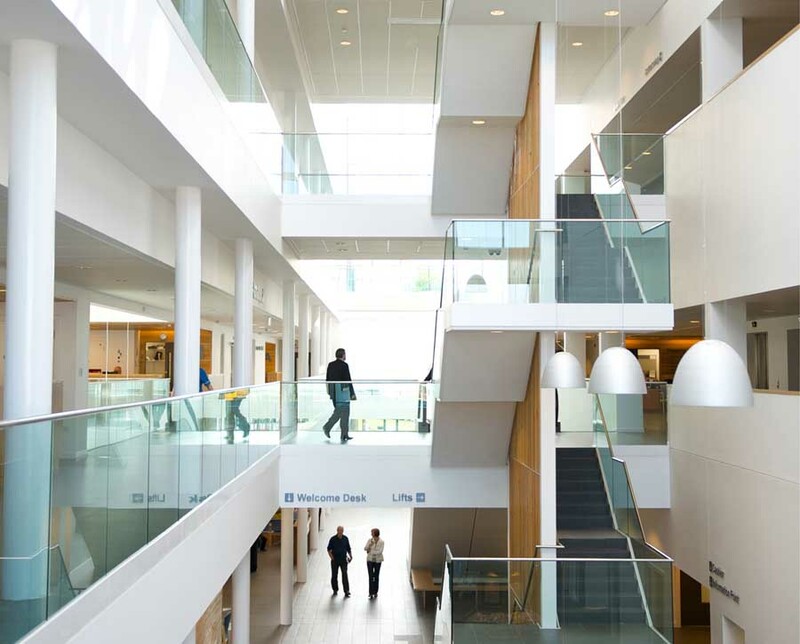 The ‘dock’ is a three-storey podium, which houses 29 operating theatres, diagnostic, outpatient, ambulatory care and emergency facilities. Above this structure, an eight storey ‘beacon’ with 1,109 single en-suite bedrooms arranged across 34 wards, will offer views over the surrounding landscape. 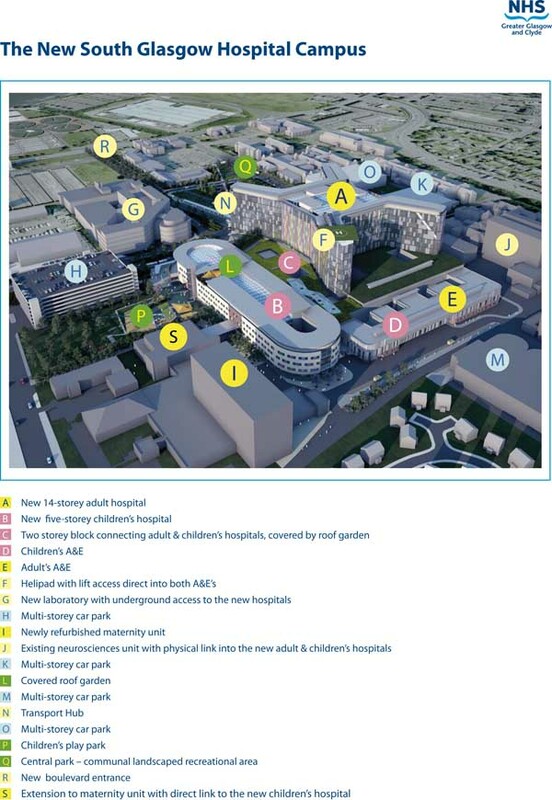 Finally, the children’s hospital, dubbed the ‘vessel’, will be physically linked to the adult hospital and has 256 beds divided into four-bedded bays known as ‘Cruciform’ wards. 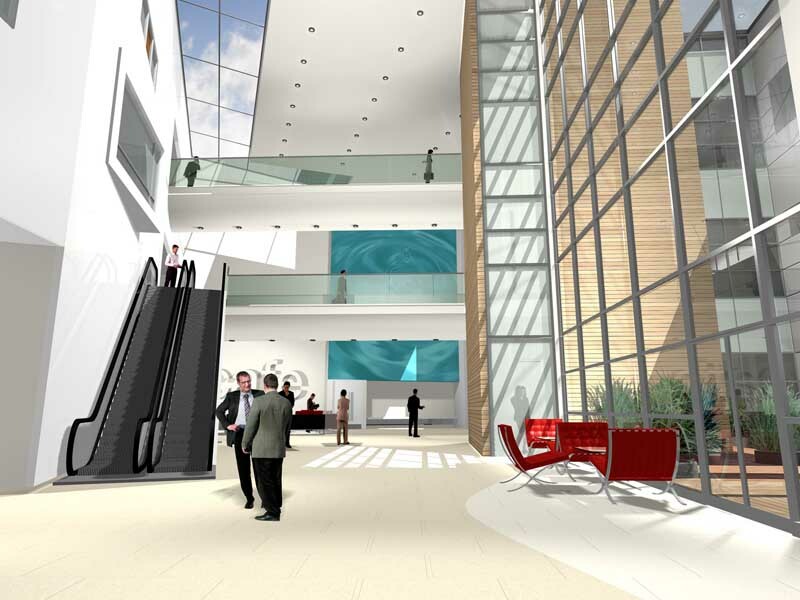 Brookfield Multiplex is the principal contractor of the project, which has been commissioned by NHS Greater Glasgow and Clyde. The masterplan and landscaping for the immense site has been designed by Gillespies. Neil Murphy, London Office Principal and Project Director, said: “The design is progressing at pace, the site is currently being made ready in terms of enabling works. Construction of the new hospitals project and support facilities is due to start on site in spring 2011.” The adult and children’s hospital is set to be completed by February 2015. The finalised plan by Brookfield Construction has been approved by the Government. South Glasgow Hospital is one of the largest hospitals ever commissioned to be built in the UK. 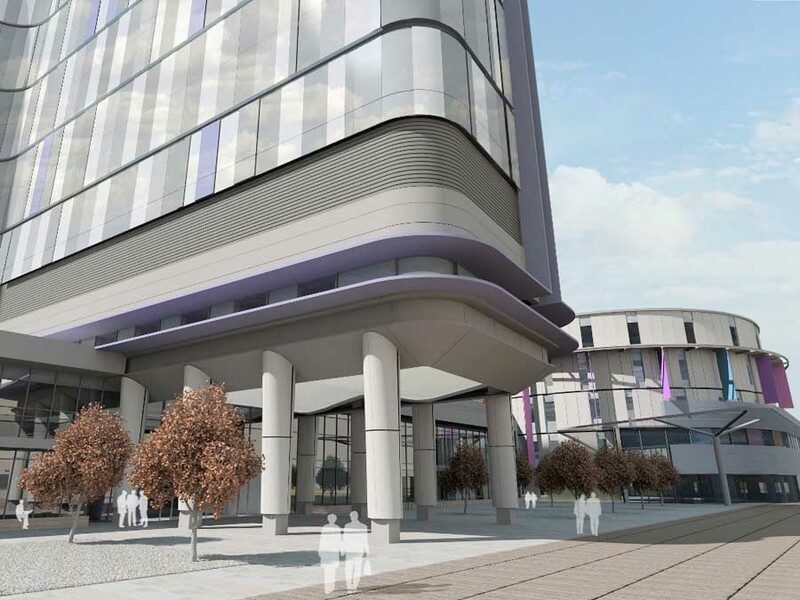 Nightingale Associates, as part of the Brookfield Construction’s UK consortium, has today been announced as the practice that will design the £840 million super hospital’ in Glasgow city centre. 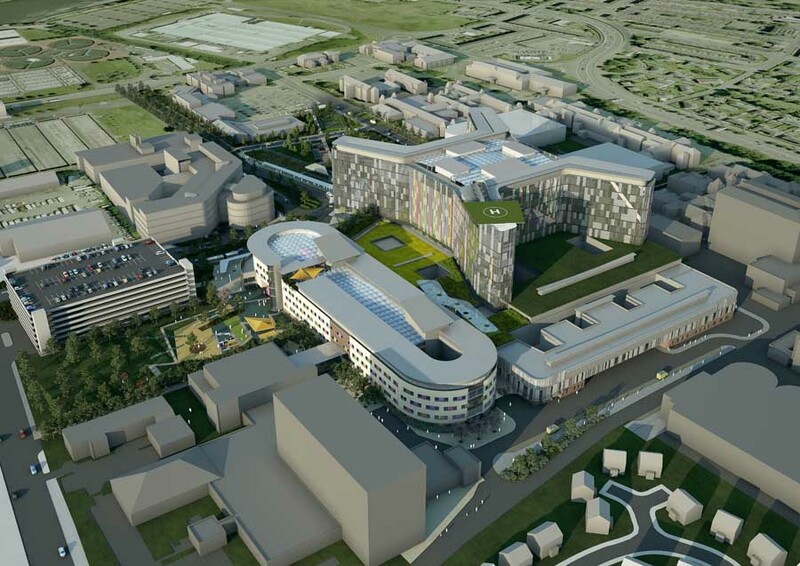 The New South Glasgow Hospital Campus will not only be the largest contract won in the practice’s twenty year history, but will also be one of the largest hospitals ever commissioned to be built in the UK. The practice, along with its health planners, Tribal, beat two other shortlisted teams to win the contract; Laing O’Rourke with Keppie Architects and Balfour Beatty with BDP Architects. 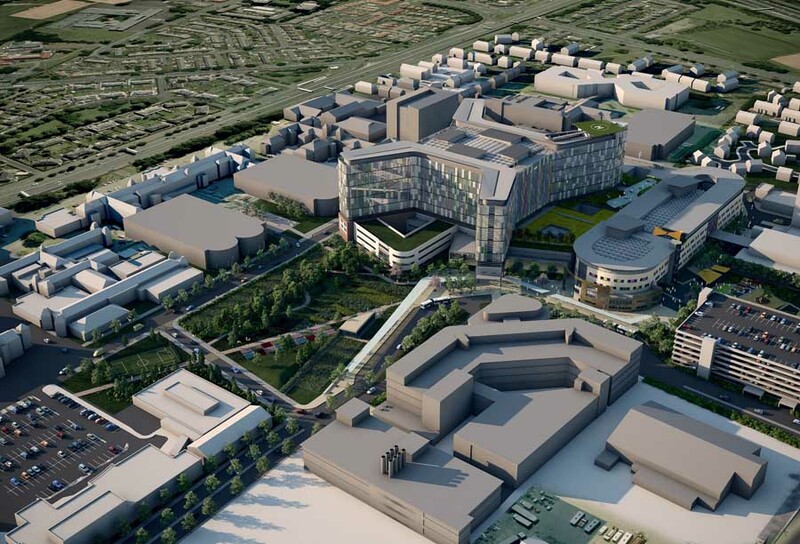 The new complex, for which outline planning permission has already been secured, will span 170,000msq and will be one of the largest “health campuses” in Europe. It will centralise acute services currently provided by three different hospitals and will comprise of a 1,100-bed adult hospital; 240-bed children’s hospital; laboratory facilities and support accommodation. Within these facilities, the development will contain many new features including a new cancer hospital; cardiothoracic service and cardiology unit; two maternity units; two new ambulatory care hospitals, state-of-the-art screening laboratory and an A&E department. 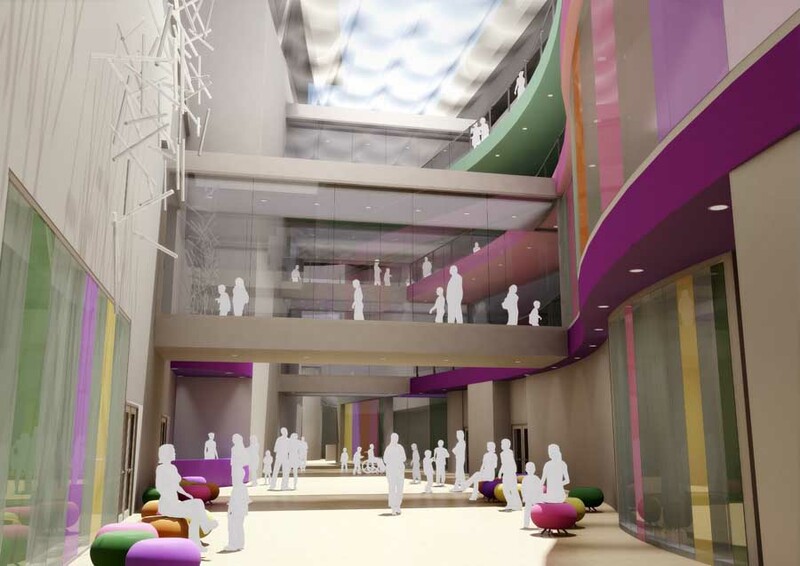 The new South Glasgow Hospital will form a large part of a period of dramatic change for client, NHS Greater Glasgow and Clyde (the Board). Over the past ten years, it has been developing its Acute Services Review, which will modernise and revolutionise acute adult and children’s health services in Glasgow. The contract will be completed in four phases, and will be a complete transformation of the Board’s existing facilities. It will be funded by public capital. The Board requires the design to reflect the importance of the project on a whole. It needs to be aesthetically stimulating and innovative, as well as having a positive impact on the city’s skyline, and create a welcoming and interesting first impression. 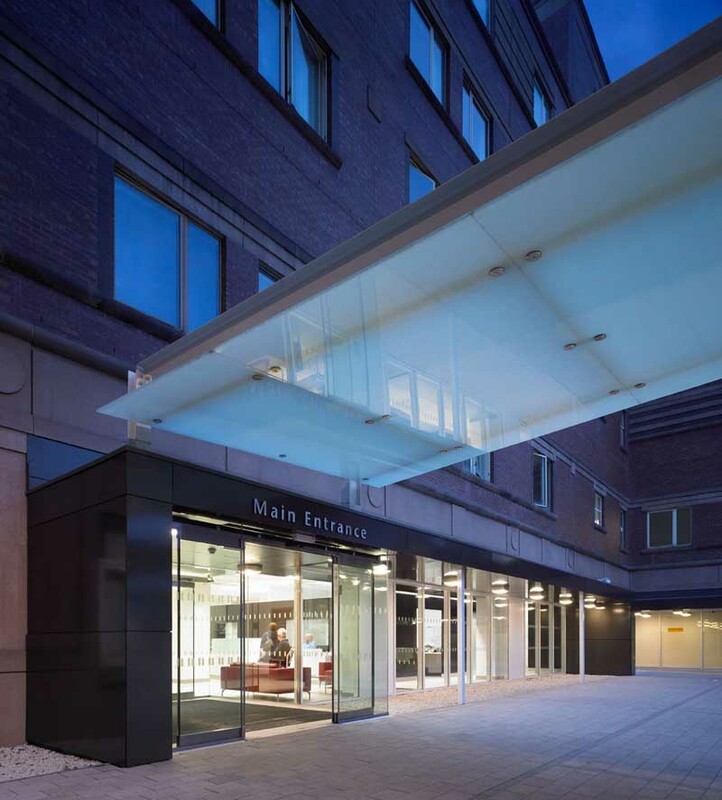 The new buildings, which need to display the highest standards in modern design, have the potential to become iconic landmarks to the city of Glasgow, as well as setting new and exciting benchmarks in healthcare in general. The building also needs to be sympathetic to the rich history of the city, compatible with the local environment and not appearing out-of-scale within the community, whilst also being future-proof and adaptable to any changes. The project will also be regarded, on a wider scale, as a catalyst for further economic and social regeneration, contributing to creating higher aspirations for development in the local area. Public transport links, easy access to local amenities and pedestrian routes & links will be just some of the benefits the new complex will bring. Landscaping, which will also be an integral part of the overall design, will produce many attractive public spaces, “knitting” the complex into its surroundings. Sustainability will also be a key element of the design, with particular low carbon emissions requirements set out by the Board. It is also essential that the building achieves a ‘Very Good’ BREEAM rating. “Tribal is delighted that it’s health planning team will be working with the Brookfield consortium to deliver this landmark hospital project. As part of the bidding process, the Board used the competitive dialogue procedure to judge each team on certain technical and commercial matters. 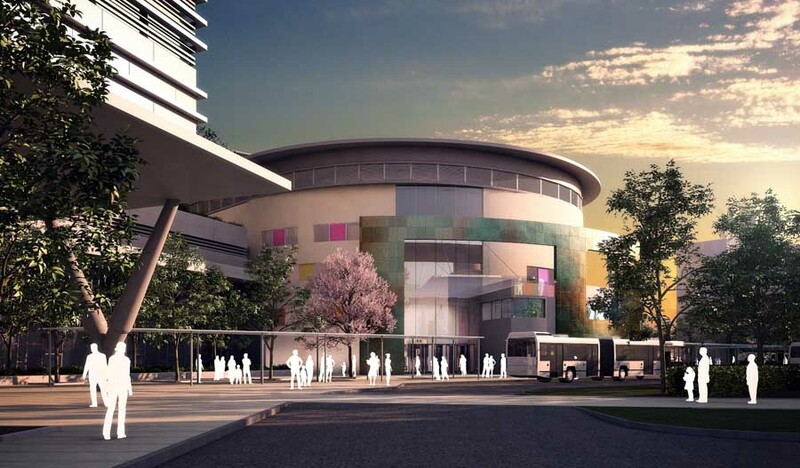 The design stage is now expected to start within the coming weeks, with construction of the first phase – the adults and children’s hospitals – due to start onsite in November 2010. The project will then reach final completion of all stages in 2015.